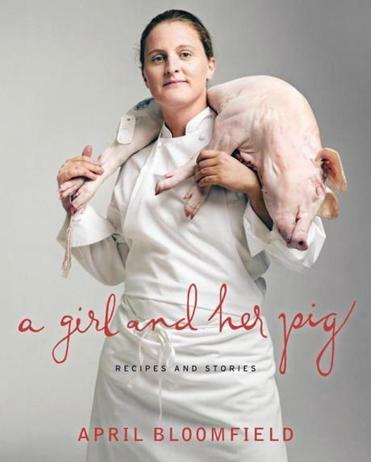 British chef April Bloomfield’s book is a collection of many kinds of recipes. At a time when chefs’ fame often seems unrelated to their food, England-born Bloomfield emerges as a purist and an innocent. When her new cookbook was published in the spring, with the chef sporting a Mona Lisa smile and a pig slung across her back, I was ready to hero-worship with the rest. A week later, the cookbook-ghostwriting flap erupted, and Bloomfield was near the center of that too, with her (credited) co-writer, J J Goode. But cooking from a book is a different matter than dining in a chef’s eatery or reading a chef’s memoir, so it ultimately all comes down to what happens in the kitchen. “A Girl and Her Pig” is simple food, prepared with a high degree of attention and artfulness. Or you could say it’s comfort food, for those who find swooning comfortable. Although the title may lead you to think that you’re getting a pork book, this book is anything but. It’s a collage of every kind of recipe, each loaded with abundant detail, tactile description, and watch-as-you-cook signposts. But what strikes me most is the way Bloomfield handles vegetables — with a respect verging on adoration. Trimmed red onions, stuffed with garlic, thyme, cream, and Italian sausage. Like the soup, a dish of Brussels sprouts with pancetta and juniper berries also comes with a side of obsession. You halve the sprouts first, then each half must be individually turned in the hot skillet so it can achieve the perfect gilding, and a nutty contrast of crisp and soft, subtly, but unmistakably, redolent of juniper. Asparagus with Parmesan pudding and prosciutto is like a perfectly crafted sonnet: savory custard balanced by perfectly bronzed asparagus and baby basil and salty shreds of prosciutto. You have to eat it with your hands to get the right combination of flavors in each bite, as Bloomfield insists you do. I’ve never before fussed quite so much over asparagus, which we eat nearly daily when it comes into season each year. But I’ve also never enjoyed it so much. 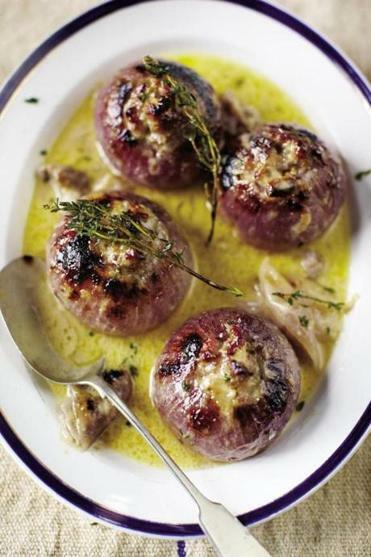 Even a simple plate of sausage-stuffed onions somehow transcends its simple construction, as the onions slowly bake to a sweet, cream-basted, roast garlic-suffused succulence. Bloomfield likes to cook with her hands. Even when you’re only dealing with raw ingredients, as in a radish, basil, and Parmesan salad, she makes it clear that the textures and flavors can only be achieved with your bare hands. “Smoosh the basil and salt against radishes,” she writes, and after you add the cheese, “go at the radishes again until some of the cheese goes creamy, some is in little chunks, and some is still in larger dime-sized chunks.” I didn’t take out my ruler. But I don’t think the chef would have considered that out of the question. Dishes with the most conventional technique were the least inspired, though might have ranked as a hit in any other cookbook. A Filipino-style chicken adobo offers adequate strong, gingery flavor, but it’s better a day or two later when it has mellowed in the fridge. A braised lamb shoulder with tomato, citrus, and anchovy is a near-perfect mix of ingredients (the citrus keeps the flavor from blurring; anchovies give depth), but it’s just a little short on the fire and precision I’d come to expect. Ultimately, how much success you’ll have with “A Girl and Her Pig” depends entirely on how willing you are to channel Bloomfield’s Platonic compulsions, to care right down to the tips of your fingers, whether the crumbling edges of the Parmesan could crumble any more perfectly, or whether the scent of the basil is better when you rub or tear it. There may not be room for the words “good enough” in Bloomfield’s world. But if you follow these recipes with care, there will certainly be room for them in yours.